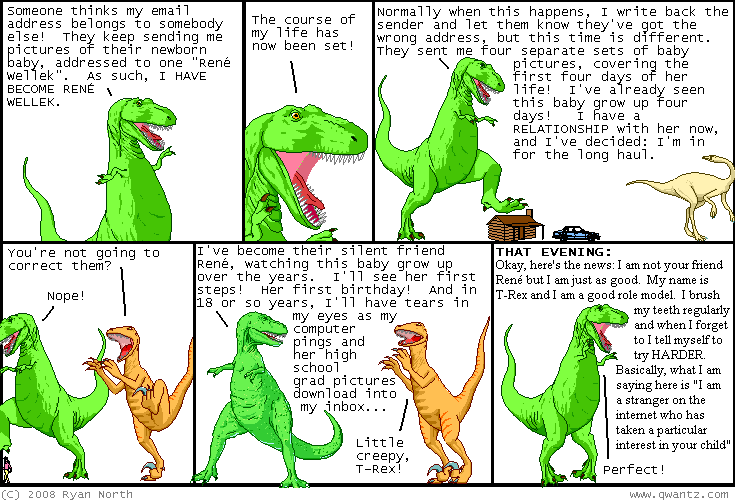 Dinosaur Comics - June 18th, 2008 - awesome fun times! –As I see it, yes! June 18th, 2008: Last night I went to the Mozilla Toronto launch party for Firefox 3! Don't let anyone tell you otherwise: the Mozilla folks know how to throw a great party. There were fancy beers AND ribs AND a webcam and mic recording it, with people watching and asking questions in a chat room. That was surreal: it was like the internet was at the party, telling me to arm wrestle with my brother, WHICH I DID. (I lost but only because I'm left-handed.) It was also surreal to see a giant chat board ask you questions and be able to answer by just talking to the screen. They're going for the world record for most downloads in a single day, which means if you could download Firefox 3 today before 1 pm, they'd really appreciate it. And I would appreciate it too, since this version of Firefox finally fixes the truncated title text bug that Randy and I have been getting an email every few days about for the past several years! MOST EXCELLENT. Congratulations, everyone at Mozilla!